This album is recorded "at Real World Studios, England, in July 1995 and featuring musical collaborations between McKennitt, her touring band and an international cast of guest artists. 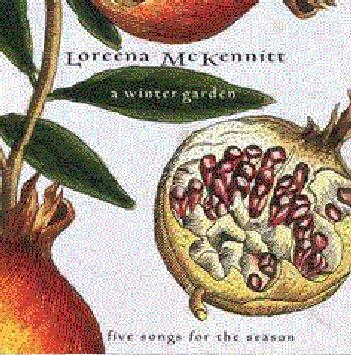 This five-track EP includes innovative, exotic arrangements of God rest ye merry gentlemen, Good King Wenceslas, and McKennitt's musical settings of the Archibald Lampman poem Snowand the traditional English lyric Seed of love." The fifth song is Coventry carol. This recording is the result of a collaborative few days, in July 1995, between some of the musicians I regularly work with and some special guests. The primary purpose was to explore the potential in our musical chemistry. I used the vehicles of some familiar and lesser-known Christmas and winter carols, as well as traditional English lyrics that I set to music in 1982 ("Seeds of Love"). Conducted in the very rural and comfortable environs of Real World Studios in Wiltshire, England, it became one of my most enjoyable recording experiences. The company and musicianship were superb and stimulating and a special thanks goes to all involved. The lyrics are also available on the Quinlan Road WWW-site. Cited text comes from a leaflet released by Quinlan Road.